I’m not sure where to start with Beijing, this is a huge and complex place. So here are some glimpses of our day. We’re staying in a 400-year-old building in Dengcao Hutong. The building oozes character but they clearly weren’t big on insulation 400 years ago. Perhaps the climate was warmer back then in Beijing. Our room opens directly onto a courtyard owned by a number of lovely cats. In summer you can have your breakfast at a table in the courtyard. Red lanterns hang from wooden beams surrounding the cortyard. 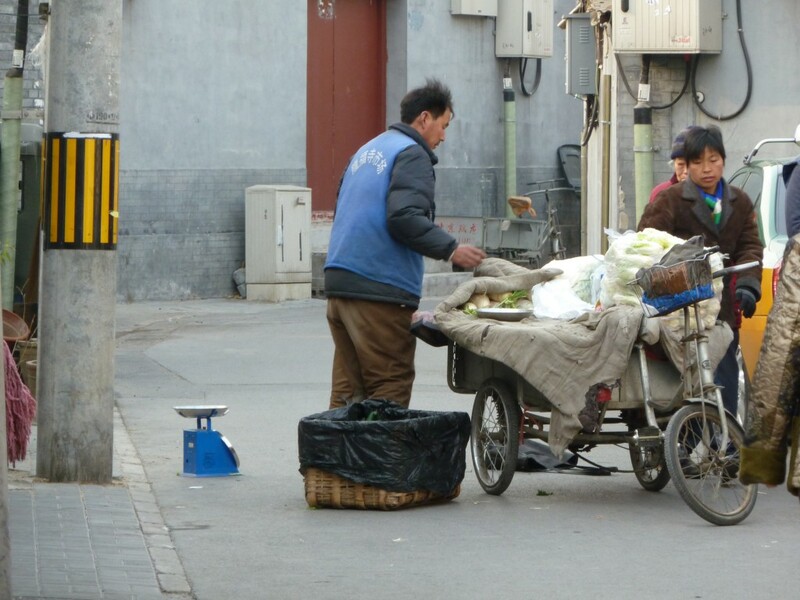 The Hutongs are a maze of alleyways where people live and work. I have a feeling that they are a pretty good analogy for modern Beijing as a whole. You’ll have a major, very modern street complete with prestige western brands – but step just round the corner and you jump back in time at least 70 years, if not more. People live in small houses with much of their life lived out in the alley. Tiny shops crowd into small spaces and then every now and again there is an imposing entrance flanked by sitting lions which was clearly in times past the local leader’s residence. As we left our hotel this morning the alleys were filled with tricycle vendors. Basically these are moving fruit and vegetable stalls. The tricycle has a flat bed at the back and each vendor will have three or four types of fruit or vegetables on display. As they ride down the street they shout out their wares and the residents come out to do their shopping. We walked to the Forbidden City past the huge, and currently iced-over, moat and were turned away by the crowds and touts. We intend to try the City again tomorrow when it is a working day and may, we hope, be less crowded. So onwards to Tiananmen Square. The scale of the square is awe inspiring, but in itself it’s rather sterile. We told the kids the story of the June 4 incident as it’s referred to here and we all smiled while looking at the spot where the man with the shopping bag faced down the tank. The Gate after which the Square is named is much more interesting and our first real view of architecture from the 1400s. Beijing has a number of buildings which date from this period and they are remarkably well-preserved. Perhaps especially after Singapore, it’s impossible to escape the fact that it is very, very cold. It was under zero much of the day and tomorrow isn’t expected to get anywhere near zero. The first shop you come to at the Southern end of the Square is Starbucks; and while normally we wouldn’t, today we did. We spent a needed hour having coffees and hot-chocolates on comfortable chairs with a stunning view.The experience cost as much as our entire dinner last night, but it was worth every Yuan. The Staubcks marks the beginning of the Emperor’s Road. This is the epiphany of modern Beijing. Think of an expensive brand rom anywhere in the world and it will have a shop here. The buildings are lovely, the street manicured with artificial plants, a policeman stands on every corner. Any yet, even here, if you step off the main road you’re immediately plunged into back alleys where people live in relative squalor amidst all the detritus you don’t see on the main road. 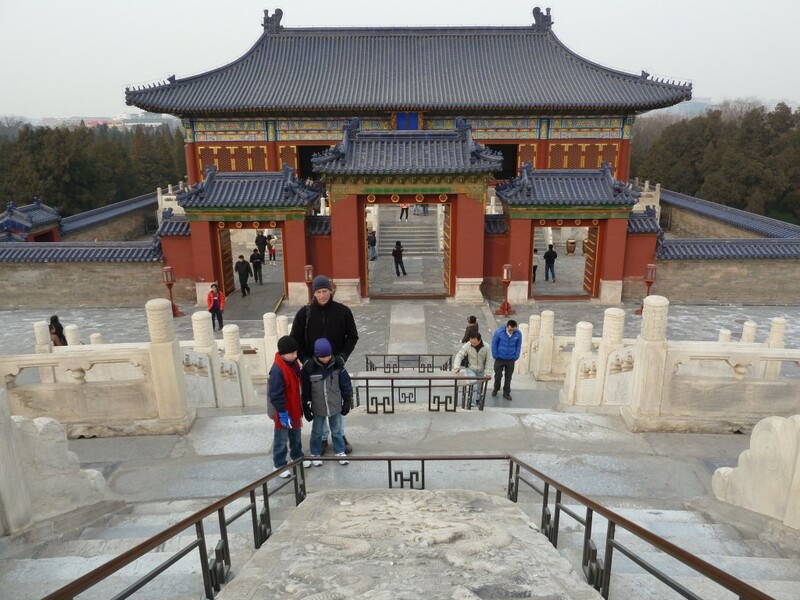 We continued to choose back roads simply because they were so much more interesting and made our way to the Temple of Heaven. This is an enormous park within which the Emperors have, for the last 4000 years, held an annual ceremony to ensure a bountiful harvest and reset the lunar calendar. The centre-piece is the wedding-cake shaped temple covered in intricate blue and gold detail which was built in the 1400s. The Temple and the surrounding buildings were absolutely stunning and I’m a little embarrassed to admit that I wasn’t conscious of their existence until today. One little aside that we all loved was the 70 year gate. Several hundred years ago one of the emperors was getting on in years. He and his courtiers were concerned that he wouldn’t be able to make the long walk required by the annual ceremony, so they cut a new door into the side of the temple walls. The emperor used it successfully, but then became concerned that his successors would take the easy way and use the shortcut as well. So the gate was barred and he passed an edict saying it could only be used by someone over the age of seventy. As none of his descendants ever reached that age, the 70-year gate has only ever been used a single time by a single person in its entire history. Walking back we came across what we thought was a playground. It turned out it was, but not for children. This was a playground for old people with a variety of exercise machines. There were many people using it including some incredibly spry old gentlemen working out on the parallel bars. The kids had a go on the equipment to quiet smiles from many of the adults. It’s been noticeable that there are not a lot of kids about and we’ve had a number of comments on ours. Further into the park there were people doing amazing things with old-style spinning tops; there were people practicing with swords; and there were kites trying to escape Earth’s atmosphere. Even in the midst of winter the park is alive and being used in a way which, if the 30-foot-high walls are any indication, was not intended by the emperors who ordered its construction. After having walked about 12 km in the cold, we decided to catch the metro back. For those in our audience in NSW, well all it’s possible to do is sigh. The Beijing transport system is lovely and efficient. Ticketing is simple and cheap. The trains tell you exactly where they are are and what will happen next. And do you know why? They’ve clearly just bought the Singapore system. It’s identical in every way. So after an easy metro trip back north we braved a local supermarket for supplies. I’m sure that most of Beijing’s 22 million inhabitants were in that building, but there are few things I enjoy more than deciphering food labels in incomprehensible scripts. We’ve bought some stuff, it may well be essential supplies or it could equally be something else entirely. Time to experiment.